Jazz Legend, Dorothy Masuka’s funeral is underway at the UJ Campus in Soweto. She will to be laid to rest later at Westpark Cemetery, Johannesburg. Masuka died last Saturday at the age of 83 after complications related to hypertension. She also suffered a mild stroke last year. Masuka was born in Bulawayo, Zimbabwe, and her family moved to SA when she was 12. Her passing has been described as a great loss to the country and the music industry. 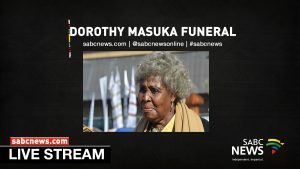 The post WATCH: Dorothy Masuka’s funeral appeared first on SABC News – Breaking news, special reports, world, business, sport coverage of all South African current events. Africa's news leader..